When I first got into breaking in the mid 90’s breaking was very different than it is today. Not the foundation really, but more the scene. Maybe the biggest difference was that nearly every crew had a boogie boy. Boogie boy was equal to all the b-boys and b-girls in the crew. In breaking crew battles the boogie boys would do their solos as well like everybody else. It was part of the battles such as the crew on crew uprock session between the battle as well. There was pretty much no boogie girls out, all guys back then. Electric Boogie, as it was called for a while, was a New York representation, hip hop’s expression of popping. Popping with a bounce as Mr Wiggles called it once. After more dancers found out on the original roots and history of popping started in California, it was natural for the boogie boys to disappear from the breaking crew battles. They grew into poppers, with a deeper understanding of the dance and somewhat of an own scene eventually. Yet at the same time I do miss seeing the boogie boys in the breaking scene too. Maybe that’s the nostalgia kicking in. Was the coolest thing for a teenager to get those white gloves on and act like one’s getting an electric shock. Every b-boy back then at least gave a try for some hand waves before return to windmills and turtles. Don’t get me wrong, I love popping to death. It’s styles, development of technique and funkiness are one of a kind in the world of dance. Yet electric boogie has a place hip hop dance history we could acknowledge, such as does the shuffle-shuffle-down crew uprock rampage. (see HERE how the boogie boys influenced the development of footwork in breaking). Digging in Cornell University’s archive earlier this year brought back a lot of memories. I bounced into a lot of articles that would take me back to the earliest years of my dance life. Check this out. 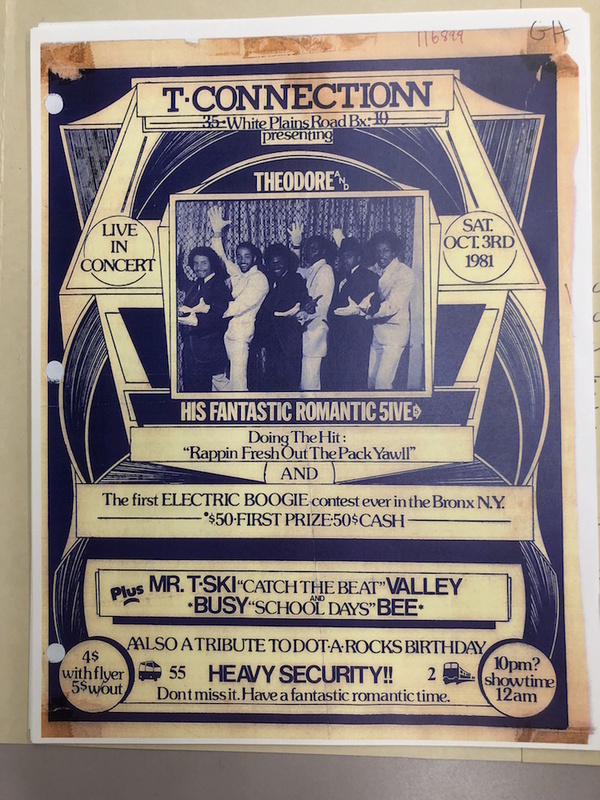 The flyer of the first ever Electric Boogie competition in the Bronx. Saturday October 3rd 1981 at the T-Connection. Theodore and his Fantastic Romantic give, plus Mr. T-Ski Valley and Busy Bee. Electric Boogie competition with 50 bucks for the winner. Heavy security so come in peace. I’m glad I can share my memories, new and old experiences and research of the dance with the Dojo and you guys. Do you have memories of seeing or trying electric boogie? Share your stories with me in the comments, would love to hear yours. Starting a hip hop related company – what does it take?